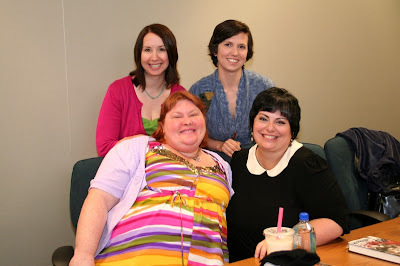 Thanks to Allison for the awesome write up on the Cassandra Clare and Holly Black Mission Viejo event. I know that I had SO much fun meeting everyone and listening to the crowd's questions. It was a wonderful group of fans! I hope you all had a great time there too. Well, without further ado, here's our debut podcast... featuring the talented ladies Cassandra Clare and Holly Black. Want to win a pair of "Red Glove" mittens? (yay for fun swag!) Well you're in luck. Just leave a comment on this post answering the following question. What character did Holly and Cassandra decide would steal the show if their characters went out to sing karaoke? Edit: CONTEST IS OVER, but feel free to answer for fun! :D Another contest will be posted next month. Music at the top provided by 46bliss. The song "Books and Letters" at the end of the show is from the band The Morning Light. For more information about your hosts, please visit our "About" page. Thank you for listening. See you next month! You win! You were the first commenter with the right answer. Send me an email at michelle at authorsarerockstars.com with your address and I'll get your prize out in the mail. So great! Loved to listen to this! And thanks for listening and commenting, everyone!